If you've been hoping to market to professionals and customers living in the United Kingdom, email addresses may be difficult for those overseas to find. It's much easier when you have a pre-verified and accurate UK email database from Bookyourdata.com! This list of valuable UK contacts is full of verified information you need to make a connection. Don't spend days sifting through expensive international databases for European business opportunities; with Bookyourdata.com, you can get affordable email lists UK marketing efforts need, download them in minutes, and integrate them right into your CRM. Selling your products and services across the miles (or kilometers) is now easier than ever. With this premium, ready-to-download UK mailing list, you can have all of the information you need — phone numbers, postal addresses, job titles, real names, and more — to motivate these new customers to buy. UK email lists rarely have this level of quality, and our human-checked listings are available at rates much lower than normal costs. And because we also offer our customers the ability to customize their own targeted marketing lists, there are numerous options for those hoping to buy email lists. 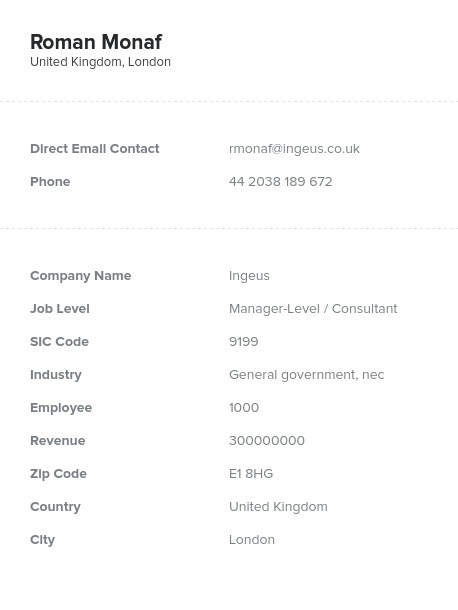 UK B2B email contacts with specific titles and industries in mind can also be found, so try our customization tool if you're interested in targeting your sales leads further. With our accurate mailing lists, UK success is right around the corner! Download this pre-made list to start emailing, calling, or mailing a variety of professionals in a new market. The United Kingdom is an important market, home to Scotland, Northern Ireland, and England. Email database downloads can be completed in moments, so get started connecting with this new group fast. Email leads, conduct business-to-business marketing more effectively, and reach across the seas to new customers in the UK today!